GRANDVILLE - [Title page] Les Fleurs. GRANDVILLE, J.J. - [Title page] Les Fleurs. [Title page] Les Fleurs. - GRANDVILLE, J.J. Title : [Title page] Les Fleurs..
Map maker : GRANDVILLE, J.J.. Date : Paris, Dubuisson, 1847. Size : 10.2 x 6.9 inches. / 26.0 x 17.5 cm. The book was a masterpiece of botanic illustration, the steel engraved plates depict an enchanting world of flower ladies, traveling amidst a floral tableaux of haute couture and insect courtiers. As a work of Victorian social satire, its intent is found beyond the delightful whimsy, and is conveyed in the book's introduction. 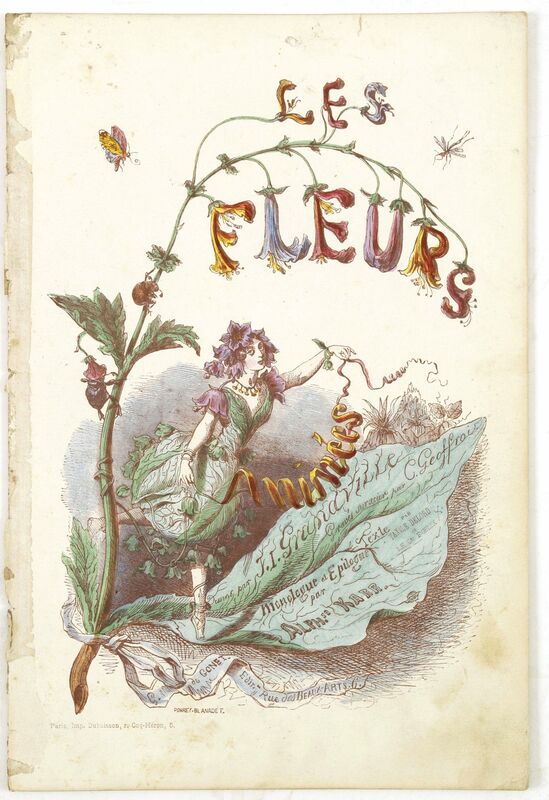 Published in 1847, Les Fleurs Animées imagines a world where the flowers reclaim the meanings bestowed upon them by a covetous Victorian audience, and become actresses in their own drama. They become nuns, nurses, village maidens. Exotic Lady Tulip bewitches, while fair young Forget-Me-Not mourns her loneliness. Expressing the personality of contemporary floral language, each femme fleur wears the silks of her society equivalent, and, with compelling histrionics, pursues her own dream. Condition : Paper slightly age toned. Steel engraving printed on thick paper. Size of paper 260x175mm.